Last weekend I had the pleasure of flying down to North Carolina to see my brother-in-law (and now my new sister-in-law) get married in Durham. It was a gorgeous wedding and it was great to see so much family and friends (we stopped in Clayton Sunday night to visit some good friends of ours); better yet, we managed to bring spring weather back to Northern Michigan! I had a lot of time in airports and vehicles to catch up on reading blog posts, magazines, and even a book on my Kindle…glorious. On our flight back north, I am came across this recipe, and knew that it would be the perfect dish to make that evening to help us ‘detox’ from our weekend. It was a snap to make, and Mike & I both really enjoyed it. Combine the teaspoon of olive oil, the asparagus, and a dash of salt and pepper in large bowl and toss to coat. Heat a large cast-iron skillet over medium-high heat. Add the asparagus and cook until the asparagus is lightly charred. Remove from heat and set aside. In a measuring cup, pour in the water. Microwave for 2 minutes or until water just boils. Add the lemon rind; let it stand 20 seconds. Drain the water and reserve the rind. In a small saucepan, add the rind, orange juice, and sugar. Whisk together, and bring the mixture to a boil. Reduce the heat to medium-low; cook until the mixture reduces to about 3 tablespoons. Combine the wine, lemon juice, mustard, salt & pepper in a small bowl; stir with a whisk. Gradually add the five teaspoons of olive s oil, stirring constantly with a whisk. Stir in orange juice mixture. In a large bowl, layer the lettuces with the asparagus. Top with the cheese, pecans and herbs. Drizzle the dressing over the top; toss if desired. I’m actually relatively new to the use of cast-iron skillets. I’ve had them in my cupboards for a long time, but wasn’t exactly sure how to use them other than over an open flame when camping. So, shoring up the asparagus in the skillet was a very easy tech week that I can use again and again, especially on nights where I don’t want to fire up the grill. I must note that I also used the cast iron toast the pecans; another technique that I’ve never tried. They were amazing on the salad and if you are not allergic, make sure that you include them when you make this. 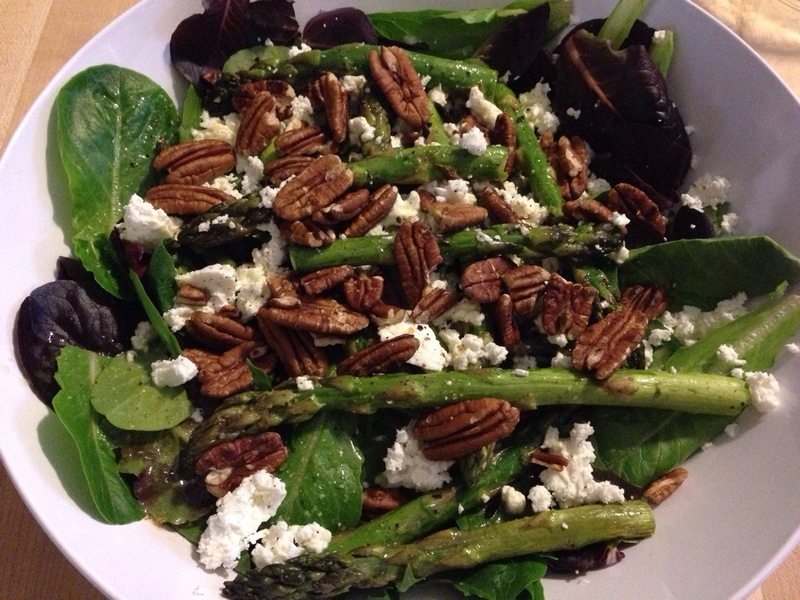 If you love asparagus as much as we do, then I highly recommend this salad. The combination of asparagus and goat cheese is not one that I would’ve thought of before, but I really enjoyed the combination of flavors. And of course, homemade dressing beats anything out of the bottle, any day. I’m really excited to add this to my repertoire of salads!